The Newest Rant: I Had An Enormous Amount of Fun at the Winter One Day! I Had An Enormous Amount of Fun at the Winter One Day! 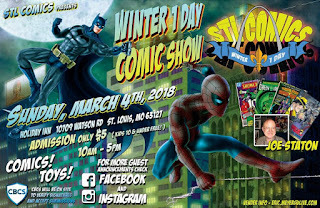 Yesterday I attended the Winter One Day put on STL Comics. It was even more fun than I had expected, with my meeting all kinds of neat people and getting a ton of great stuff. I thought I would break things down into those two categories, and offer some closing thoughts as well. A bunch of people entered as soon as the doors opened to begin the show! While at the show I ran into old chums like Justin of Wayne Kent Comics who always has stellar books, as well as my friend James who has Cabal Books. Bigfoot Comics was on the floor as well, with a ton of books, including some really snazzy old underground reads. Lisa from Geekery Gal had a wide selection of delightful geek-themed jewelry that was impressive as always, and I ran into some of the pleasant folk from Toys of Our Youth. In addition, I was greatly impressed by the art on display from Wood + Laser who had some striking laser-engraved pieces featuring everything from comic-book characters, to fantasy, and sci-fi. Not to mention, I ran into David of Callisto Comics who had some recently-released books from his own shop he'd pulled for me and was kind enough to bring to the show. Plus, there were vendors-upon-vendors besides the ones who I have already mentioned selling tons of comics and toys. Speaking of all the awesome wares, how about I share some of the items I was able to purchase or trade for? At the show I was pleased to meet the creator of, "Xeno-Guardian Red Visor Go!," and editor of, "Pusherman," two different comics that both sounded cool. "XGRVG," is an all-ages book that sounded fascinating to me as it is about a young woman who gains the power of the super-hero from an old television show she watched years ago, and is able to use powers through remembering the show. It basically is a comic about the power of nostalgia and all the positives and negatives our love for the past can cause us. As I've written extensively about nostalgia and the concept of, "Weaponized nostalgia," this of course appealed to me right away. Plus, the comic's fun manga-esque art was really cool too. 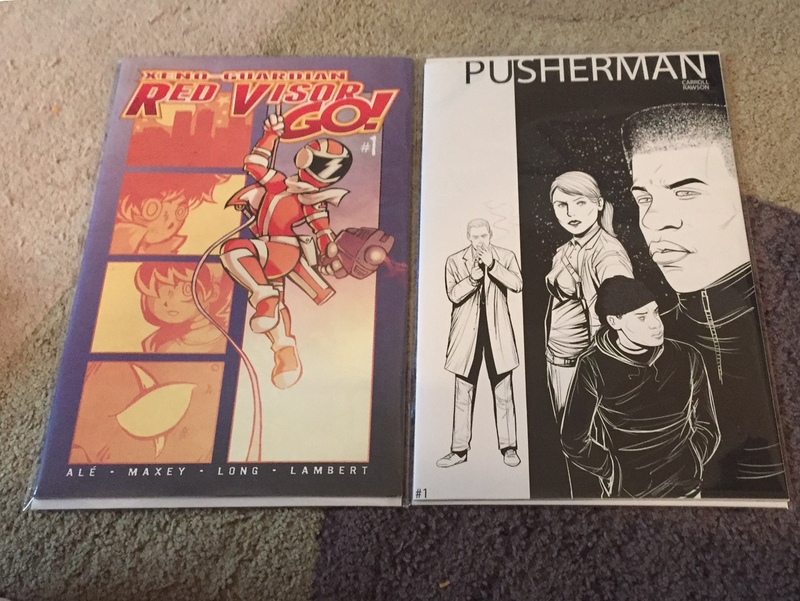 Pusherman is a comic about the rise of crack-cocaine in the 1980's and looked extremely interesting so I was eager to pick it up as well. You can learn more about Xeno-Guardian Red Visor Go at its Facebook page or Twitter account, and check-out Pusherman here. "Ironclad," is a trade paperback by Mark Stegbauer that follows the adventures of a young man named Max Clad who acquires an alien battle suit while on Summer vacation and has to protect Earth. It comes out later this year from Committed Comics but Mr. Stegbauer had some advance copies for sale. Between the fun concept and snazzy artwork I was eager to buy a copy--plus I got a snazzy free print! 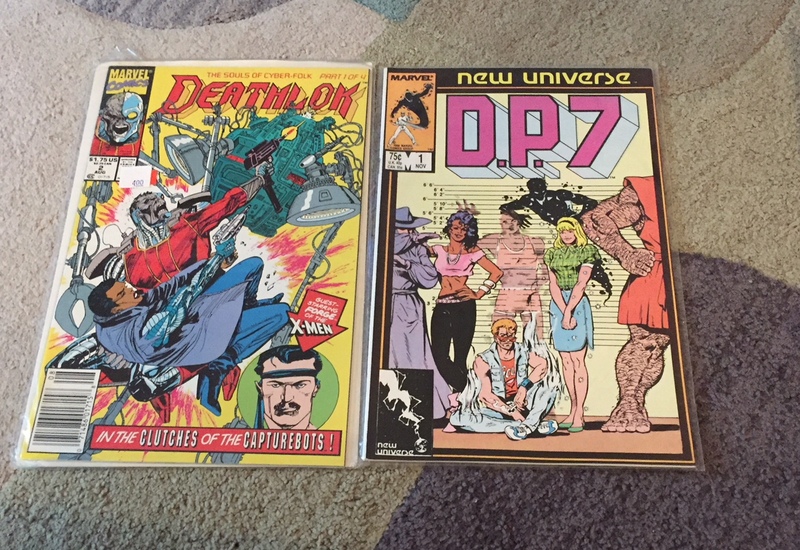 I have a soft-spot for the old 1990's comics with their over-the-top violence and cheesecake. These old, "Swimsuit specials," were worth grabbing for that reason and as I'm a fan of J. Scott Campbell I couldn't pass-up this swanky black-and-red variant cover to the first issue of the recent re-launch of, "Vampirella." 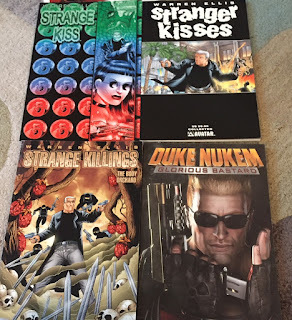 I spotted theese old trade paperbacks by Warren Ellis and Mike Wolfer and made sure to grab them. As there was a deal if we bought four trades I grabbed the random, "Duke Nukem," one too out of a morbid curiosity. The first-ever issue of, "Criminal"
I'm a big fan of Ed Brubaker and Sean Phillips, so I was overjoyed to find a very reasonably priced copy of the first-ever issue from the debut arc of their series, "Criminal." While there were plenty of stellar story-lines, the first one, "Coward," always just stuck with me the most. A fantastic find! 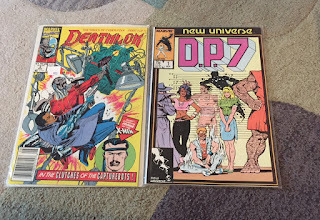 "Deathlok," always had such good covers, and I've been told, "DP7," was the one good comic to come out of the, "New Universe," debacle of the 1980's. There were only a buck each so I couldn't pass them up! I've made it no secret I'm a big fan of, "Stabbity Bunny," and that made me very excited to pick-up this awesome variant cover for issue #2 featuring a hilariously twisted homage to, "A Clockwork Orange." It is delightfully, "Wrong," for sure. There was a big crowd but it was still possible to navigate comfortably. The Winter One Day put on by STL Comics is a comic-con in its purest and most joyous form. It was all about geek-culture and didnt have anyone randomly selling leaf-gutter guards. It was a show focused on comics, toys, geek-themed jewelry, and otherwise was just wonderful. There was a big crowd of people enjoying looking at all the books from the expensive to cheap, underground to mainstream, and it was just plain fun. There were comic-creators there, and they were given respect and attention as opposed to some pop-culture cons where the focus is on D-list celebrities like your Tara Reid's or such and amazing creators are ignored. I saw a lot of families with young children, which made sense as tickets were a reasonable $5 with anyone 10-and-under free, something that encourages people to bring their young folk and get a whole new generation interested in comics, toys, and all the awesome stuff at the show. It is hard to deny there is a special magic to a comic-con that makes sure to emphasize that, "Comic," part. 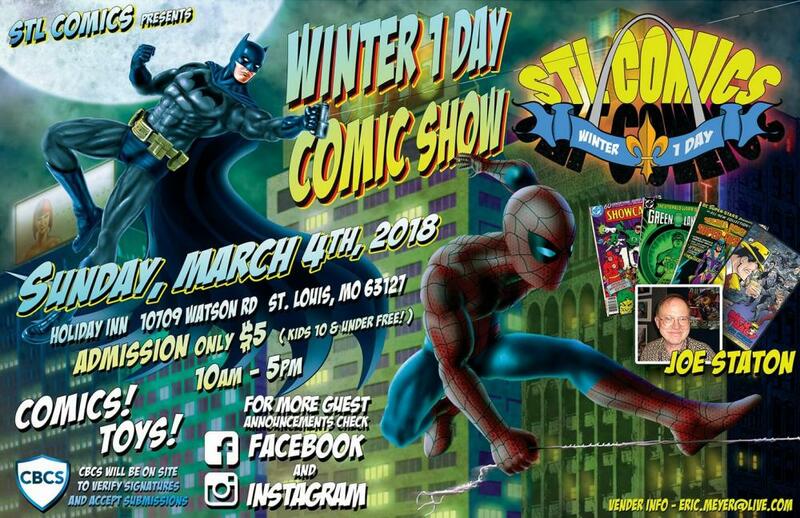 I had an amazing time yesterday at the Winter 1 Day and encourage everyone to check out STL Comics on Facebook so you can be aware of what else they have coming-up in the future. For anyone who lives in or near Columbia Missouri, they will be having a Micro-Con May 20th, and while I may or may not be able to make it out that far, I would recommend anyone close enough go for sure. STL Comics knows how to put on a good show and as long as they keep doing them I'll be sure to keep saying how rad they are!